Sunday, October 18, marked “Adoption Day” for the Joint Comprehensive Plan of Action (JCPOA, or the Iran Deal) between Iran and the group of powers known as the P5+1, comprising the United States, the United Kingdom, France, Germany, Russia, and China. Per the Iran deal, “Adoption Day” is the date “90 days after the endorsement of this JCPOA by the UN Security Council” (otherwise known as “Finalization Day”). The Security Council adopted a resolution on the deal on July 20, 2015. On adoption day, the JCPOA comes into effect. Basically, starting Sunday, the terms of the Iran deal are binding on its participants and the deal moves from paper to reality. For its part, Iran is required to inform the International Atomic Energy Agency (IAEA) that it will implement the organization’s Additional Protocol. Iran’s ambassador to the IAEA told Iranian state media that Iran has held to this commitment and communicated its intent to implement the Additional Protocol. Iran is also required to implement certain provisions in its agreement with the IAEA known as the “Road-map for the Clarification of Past & Present Outstanding Issues” (wrongly described as a “secret side-deal” by some commentators in the United States). Without verification of Iran’s successful compliance with these “Adoption Day” requirements, the JCPOA’s “Implementation Day” (a significant milestone for sanctions relief) cannot come into effect. In exchange for Iran’s good faith compliance with its “Adoption Day” requirements, the European Union and the United States are required to issue conditional sanctions waivers. The “conditionality” of these waivers mostly comes down to the fact that, per the JCPOA, most of this sanctions relief won’t come into play until “Implementation Day” for the deal. 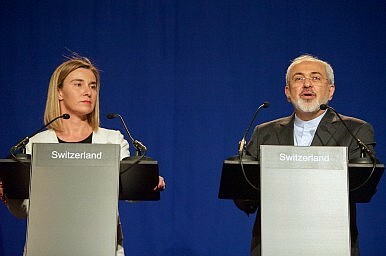 “Adoption Day” also marks the start of a process between the United Kingdom, France, and Germany (the three European members [E3] of the P5+1) and Iran to prepare an official document outlining the scope and process by which the so-called E3 will participate in the modernization and modification of Iran’s IR-40 Arak Heavy Water Reactor. The Arak reactor, which has never been operational to date, will be modified to function as a hybrid water reactor, using both heavy and light water as a coolant and moderator. Interestingly, Iran has requested China’s help on the Arak redesign effort, even though Beijing is not specifically required to do so under the JCPOA. While many of the stipulations of the JCPOA “come into effect” on this day, the date is more significant as the benchmark by which several important Iran deal terms and time limits will be measured. For example, eight years from adoption day (so October 18, 2023), the European Union will terminate its proliferation-related sanctions for Iran (provided the IAEA doesn’t specify that Iran’s nuclear material is exclusively being used for peaceful activities earlier than that). Similarly, eight years after Adoption Day, the United States will look to terminate its nuclear-related sanctions as specified in Annex II of the JCPOA. Both deadlines refer to what is known as “Transition Day” in the Iran deal. “Adoption Day” is here and it’s a significant milestone in the plan outlined by the JCPOA. Much has happened since July 14, 2015, when negotiators from Iran and the P5+1 announced the final text of the deal in Vienna, Austria. Notably, the deal has crossed two important domestic political hurdles: It has avoided formal legislative disapproval in both the United States and Iran, the two parties to the JCPOA where there was most concern about a negative legislative outcome. Critics of the Iran deal persist in both Washington and Tehran, and the months between “Adoption Day” and “Implementation Day” will be crucial for the credibility of this agreement. Compliance failures or delays by either Iran or the P5+1 will be subject to intense scrutiny.